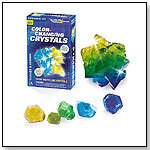 With this kit, kids can grow amazing crystals that change color. Learn about the chemical reaction that causes the beautiful shift in colors, and examine the factors that influence the reaction. Conduct a chemical analysis to better understand why the color change occurs. Show off the crystal creations in two special locking display cases. — In a Fall 2013 survey, three out of 12 retailers told TDmonthly that Thames & Kosmos was a best-selling brand of science toy.